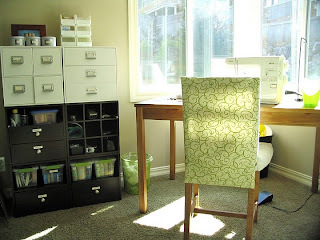 In my craft room I am trying to incorporate GREEN into the builder-beige palette so I figured that making a partial slipcover for sewing desk chair would be an easy way to bring green into the room without making a large, permanent commitment to the color. Every once in a while I discover something fabulous in the remnants bin at the local JoAnn's. It's a great way to get a yard or less of expensive fabric for a big discount. The only catch is that you then have to figure out what to do with that small amount of fabric! So I had this piece of green and white decorator fabric which was obviously too small to make a curtain out of. I could have made pillows out of it, though I would have had to pair it with another fabric to get more than one substantial pillow. However, I recalled one of those home improvement TV shows where the designer took a family's old dining set and made these little slipcases for the tops of the chairs to instantly update them and make them fresh and white. I decided I would try that project myself! It took about 30 minutes to make my own slipcover for the chair in my crafting room. It probably would have been a lot faster if I didn't waste time figuring out how to do it, but once I figured it out it was really easy and I could have replicated it quickly if I had more chairs (and more fabric) to go through. This is definately something you could do in a batch to quickly transform your dining set, or just decorate an accent chair or desk chair like I did. The"before" picture, from June 2010. The poor chair looks naked. If I ever get bored with green I can make a new one in PINK or maybe ORANGE... whatever color is the new BLACK.